Fourth Row Center: Film Writings by Jason Bailey: New on Blu: "The Comancheros"
John Wayne's entrance in The Comancheros is accompanied by his opening credit--"JOHN WAYNE in," blasted across the screen in big red type, the Duke behind his name, larger than life on horseback in front of a picturesque view of the Utah mountains. That, friends, is how you herald a movie star, and The Comancheros is a top-notch Wayne vehicle--boisterous, energetic, splendidly photographed and vigorously entertaining. The story begins in New Orleans, circa 1843. Paul Regret (Stuart Whitman), a dandy in a top hat and $300 suit, kills another man in a duel. He does so fair and square, but his victim is the son of Louisiana judge, and soon Regret is wanted throughout the South. Enter Texas Ranger Jake Cutter (Wayne)--occasionally called Big Jake, even--who finds Regret on a riverboat, where he has struck a spark with Pilar (Ina Balin). Regret escapes before Cutter can return him to Louisiana, though they cross paths again when Cutter goes undercover to infiltrate the "comancheros": white gun and whiskey smugglers working with the Comanche. Regret ends up helping the Rangers fend off a Comanche attack, so a kind of respect and admiration grows between the two men--a story arc not unknown in the Wayne canon. 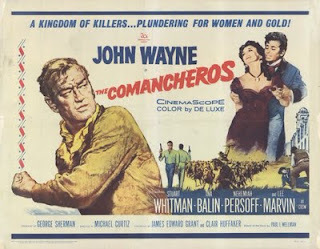 The Comancheros was the final directorial credit for the great Michael Curtiz, whose films included Casablanca, White Christmas, and The Adventures of Robin Hood. He fell ill about halfway through the production, so Wayne (who had made his directorial debut with The Alamo the previous year) took over; the transition is seamless, as both men work in a charmingly old-fashioned style. Action sequences are well-executed, and the character beats are energetic, thanks to a cast of reliable old hands including Jack Elam, Bruce Cabot, Edgar Buchanan (wonderful as Judge Breen, who memorably defines perjury as "a big dumb blasted lie"), and Wayne's son Patrick. And then there's Lee Marvin, who drops into the film like a lit stick of dynamite. As Tully Crow, the contact man for Cutter's undercover operation (Cutter assumes the identity of a gun runner named--amusingly enough--Ed McBain), Marvin is simply electrifying--and he boosts the energy of Wayne, who knows a potential scene-stealer when he sees one. Their byplay is entertaining, reckless and unpredictable, veering from back-slapping revelry to open hostility in a blink; Marvin is gone too soon from the picture. The Comancheros is occasionally discomforting, as it (expectedly) contains the usual troublesome perspective of Native Americans ("Comanche... Indians?" Regret asks a kid a the Rangers camp. "Sure, the worst kind!" the kid replies, cheerfully), and watching them get wiped out in the film's triumphant final battle is as difficult as ever. But one has to recognize that those attitudes were par for the course, at that particular time; if one can look past that unfortunate truth, there are some complexities to the film, particularly in the somewhat sympathetic portrayals of those at the comanchero outpost. 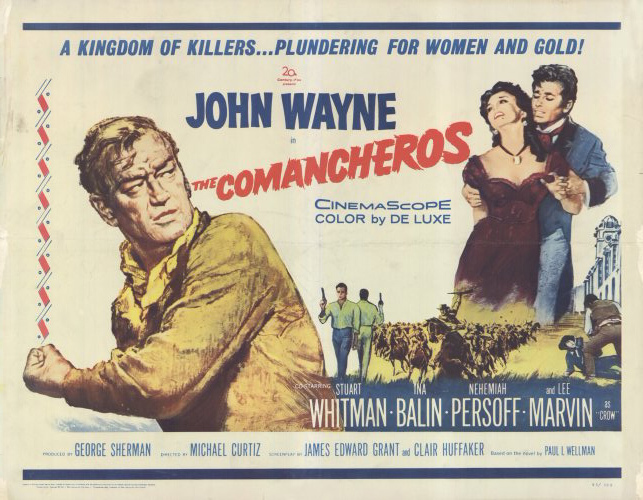 Above all, The Comancheros is a John Wayne picture, and it's a good one. Screenwriters James Edward Grant and Clair Huffaker (adapting Paul Wellman's novel) give Duke some good lines (offered a bribe by Regret, he intones, "I've got what you might consider a weakness: I'm honest"), and the way he calls Regret "mon-sewer" is a small pleasure, but an indelible one. The film's only serious issue is that it needs more Lee Marvin. But seriously, what film doesn't? "The Comancheros" is available now on Blu-ray. For full A/V and bonus feature details, read this review on DVD Talk.